I'll have the pleasure of teaching at the Danish Institute for Study Abroad (DIS) in the fall, on a course run by my colleague and urban liveability expert Bianca Hermansen. The courses are populated by and large by American students doing a semester here in Copenhagen. I'm looking very much forward to it. Especially if there are more students like Lora Matway showing up at DIS. living. She likes people-watching and public buses. She's kindly allowed us to blog her observations from a recent course at DIS. We're thrilled of her usage of Michel de Certeau in her observations. De Certeau was also used in our Choreography of an Urban Intersection anthropological study. Using de Certeau in relation to liveable cities and especially bicycle culture is a given. A must. Everyday Life distinguishes architectural design from actual human use through the discrepancy between technical language and vernacular. The bird’s eye model, like the grammar book, is regularly bent and broken by the immediacy of street-level contact that we make with our surroundings. For De Certeau, urban planners are “grammarians and linguists” whose aim is to punctuate and revise with signs, overpasses, and medians. Meanwhile, the everyday travelers through these spaces scribble in the margins of city streets with their bicycle tracks. Their slang is jaywalking; their refusal to travel in straight lines a run-on sentence; stopping one’s bike to talk, a made-up word. In other words they—we—are responsible for all things “surprising, transverse or attractive”. Like patches on pants, the visible wear on a place’s original blueprint is its evidence of life. 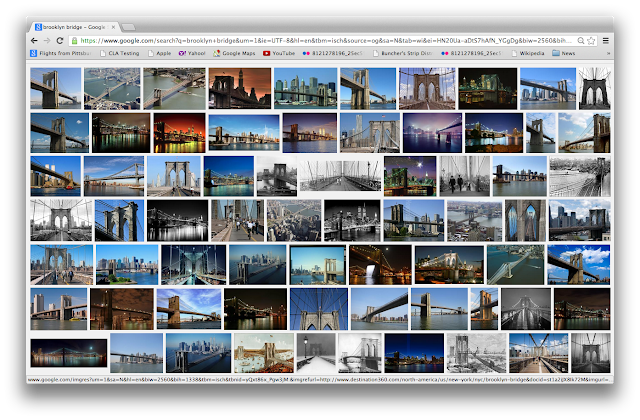 To tie this theory to something solid I typed “brooklyn bridge” into my Google Image search bar. Google searches are samples of public thought, quilts of input from everyone on anything. And for this symbolic New York bridge a boatload of colorful perspectives showing off its stature and backdrop popped up; apparently there the public eye is caught by design. 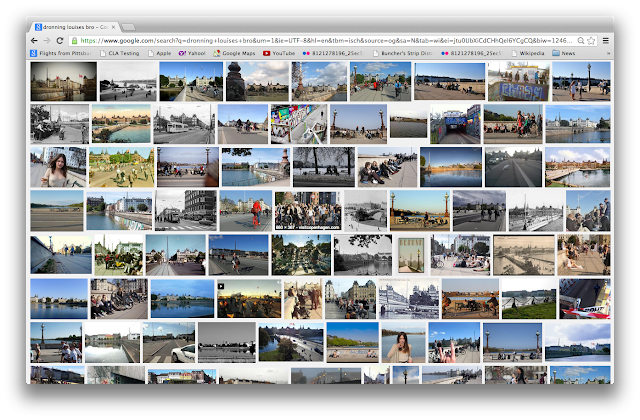 Then, I searched “dronning louises bro” (Queen Louise's Bridge) and instead of counting angles and filters I was counting faces and wheels. Here the stitchwork of thumbnails is about human poetry, not steel symmetry. The Dronning Louises Bro vibrates with presence. People settle over the Dronning Louises Bro in the first place because it’s a nice place to be. The bridge welcomes Michel de Certeau’s street vernacular by being bikeable and walkable. There’s no reason to stay on a bridge like the Brooklyn because it only makes sense to cross it in your car. 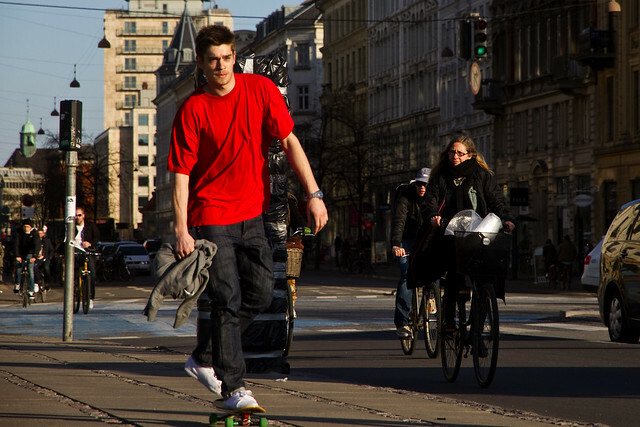 If only cars were allowed on the road, the Dronning Louises Bro would perhaps be just as stoic. Instead, its simple wideness and emphasis on cyclists gives it pliability that is much more attractive to the camera lens—and the passing person—than a cold piece of design. Bikability and walkability are directly proportional to comfort. As humming in person as it is on the Internet, this Copenhagen bridge is unfailingly local and social compared to its lonely American cousin. It is easier to belong to for however long it takes to get across, or drink your coffee, or watch the sun set; its built freedom of speech gives soul to routine comings and goings. Image search results for "dronning louises bro" (above) and "brooklyn bridge" (below). Try it yourself.